Hello. It's time for a new Ribbon Girl challenge. My card features the new Hero Arts Postmarks digikit. I used all the fun postmark stamps to create the background, and made a little postcard using the Postcard stamp from the kit. I added a typed sentiment, and some cute Studio Calico butterflies, embellished with Hero Arts buttons and some yummy chocolate button twine. I finished the card with some delicious Siam Pink Seam Binding. Wow what a beautiful card Lucy! Love the digi bg! Gorgeous! Love the butterflies and the twine! I love how you used this digikit, Lucy! The background you created is awesome and the pink bow is so pretty against the neutrals! 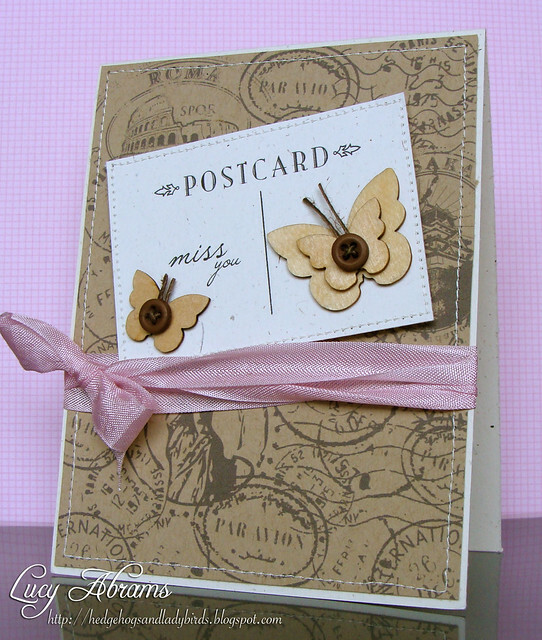 Stunning, just love the mix of postmarks and butterflies - perfect! !